Eat Local: Do You Viajando? Viajando by LV Mar started out as an invitation-only, thank-you party for the restaurant’s supporters earlier this year. (“Viajando,” if your Spanish is a little rusty, means “to go on a journey” or “travel.”) With the success of that first event, the restaurant’s owners decided to create an ongoing celebration of Latin destinations and to expand the invitation list, opening it up to the public. Destination: Brasil debuted in July, followed by Destination: Mexico (the event I attended) on September 3. Michael says that the events will continue, likely on a monthly basis, focusing a different Latin destination each time. Destination: Caribbean is up next, on October 1, to be followed by Destination: Peru later this year. Weather-wise, the evening of LV Mar’s Mexican celebration could not have been more perfect. The unseasonably warm weather with a touch of humidity had me thinking about vacations I’d spent in Mexico. My friend Amy joined me for the evening, and when we arrived for our 7pm seating, the restaurant was bustling, and the celebration was in full swing. 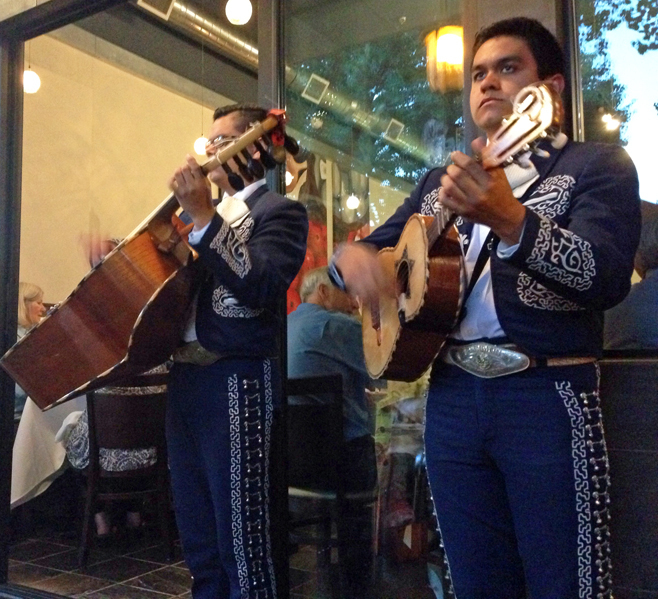 Diners who had opted for the 6pm and 6:30pm seatings were enjoying their first and second courses, while mariachi musicians strolled the restaurant. The restaurant’s large windows and sliding doors were completely open, bringing the outdoors in and creating a party atmosphere. Strands of clear lights had been strung from the restaurant to the trees lining Broadway, bringing the party into the street. Amy and I opted to sit outside to enjoy the weather and have a clear view of the street and the restaurant. The experience reminded me a bit of dining at a small, family-run restaurant in San Miguel de Allende a decade ago. With the mariachis serenading us, we began our evening with cocktails from LV Mar’s beverage menu: the El Morado (blackberry juice, basil, petrov wine vodka, and sparkling wine) and the LV Sangria (red wine with fruit juices and house-made hibiscus syrup). 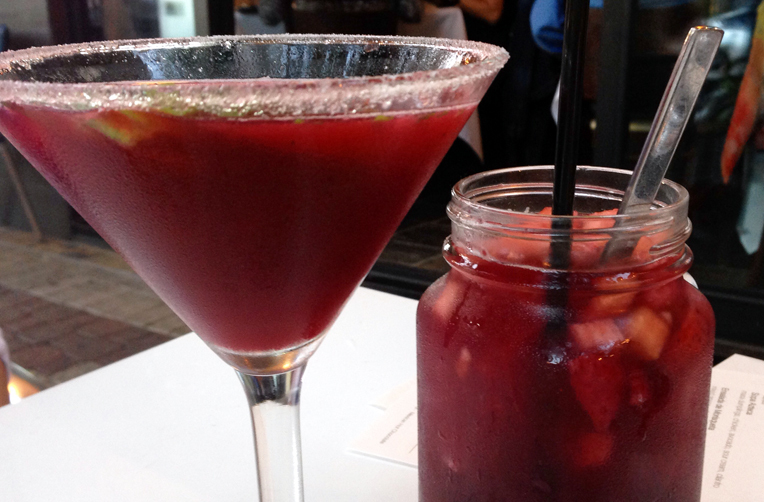 While both cocktails were fruit-forward, neither was overly sweet. The sangria had a flowery, berry flavor that was unique and enjoyable — and a nice variation from the usual, citrusy versions I’ve had elsewhere. El Morado was well-balanced between the herbaceousness of the basil and the sweet-tart fruitiness of the blackberry. (It was the more unique of the two, but the sangria was no less delicious.) While we enjoyed the cocktails, our first course, a trio of snacks to share, arrived. Ceviche is one of the things LV Mar does best, and the halibut ceviche was, as anticipated, delicious. 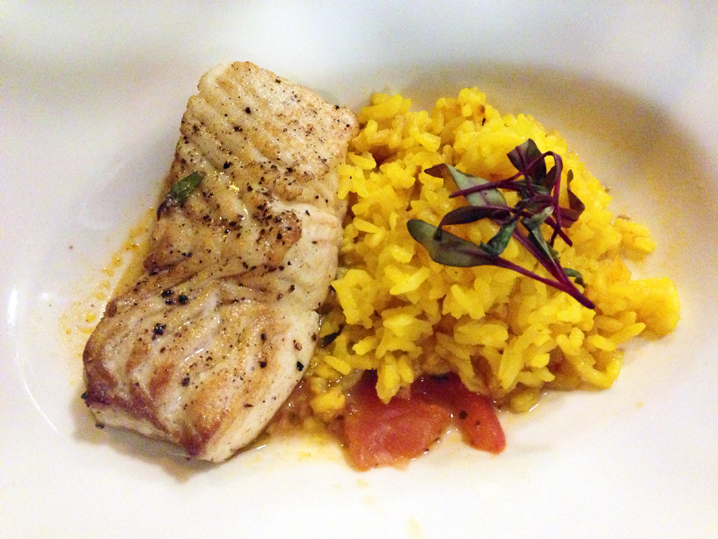 Chef Manuel paired tender halibut with just the right amount of spice and acid. I’m allergic to avocados (yes, really), but did indulge in a piece of smoked trout or two. Amy said the combination of the guacamole with the trout was “very tasty” and not too spicy. The smoky, salty trout provided a nice complement to the creamy, bright guacamole. 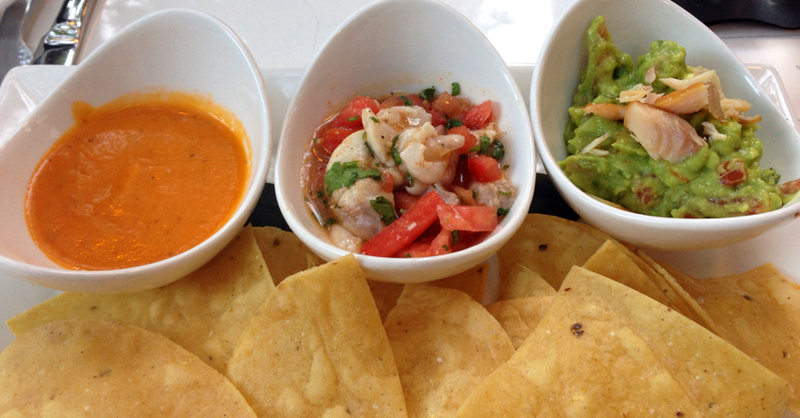 Mexico is a country rich in regional cuisine; there is no single “Mexican” food. Sure there’s the well-known street food, such as tacos and tortas, but there’s so much more to Mexican cuisine, such as the moles of Oaxaca and the fresh seafood dishes of Veracruz. Chef Manuel’s menu offered a culinary tour of Mexico, pairing traditional, regional flavors and dishes from around the country with his unique, contemporary approach. The Tapas course brought the Sopa Azteca and the Ensalada de Morisqueta. The soup — oh my, the soup! Here I was thinking: eh, hot night, and soup? It looks like a simple soup, but once I tasted it, I didn’t want to stop eating it. I was surprised by the layers of flavor. 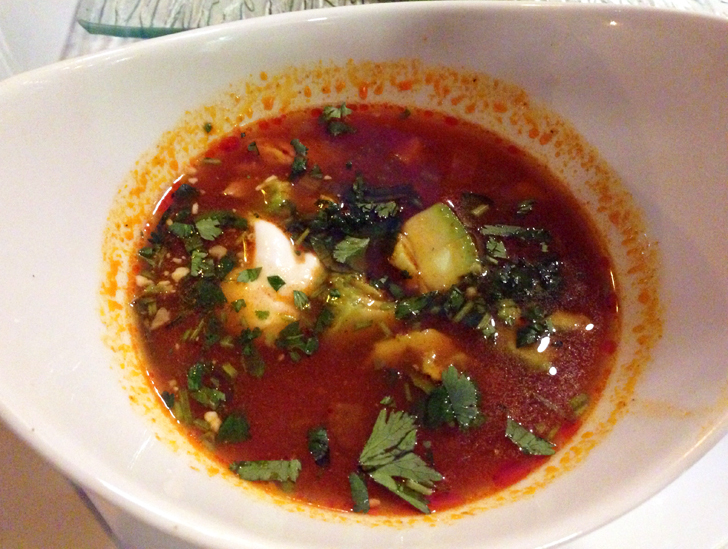 The broth was rich, tomatey, spiced — but not too spicy — full of body and flavor. The chicken pieces were incredibly tender and flavorful. The sour cream and avocado added a creamy contrast to the broth. The salad was a nice summer-to-fall dish, inspired by Moresquita, a traditional cooked rice dish from Michocan. 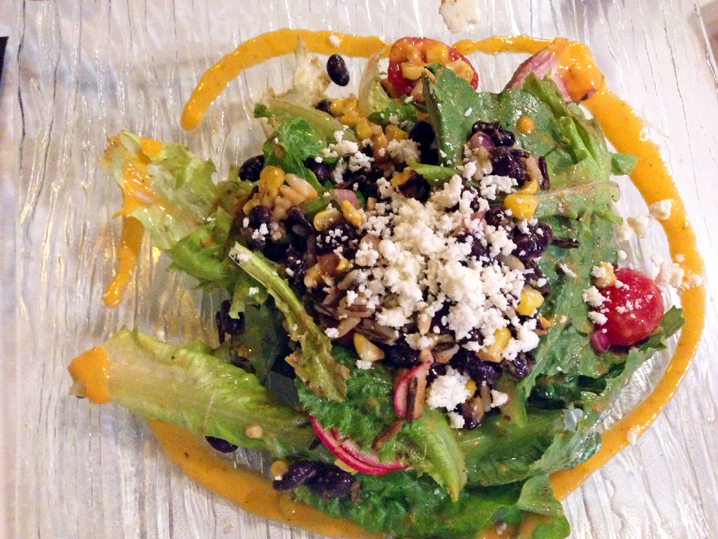 Chef Manuel incorporated ingredients of the traditional dish — rice, beans, tomatoes — into the salad, creating a refreshing, flavorful salad that provided a crisp contrast to the rich soup. (The two work well together as course and could make a satisfying fall lunch or light dinner.) As with the soup, texture and flavor are essential to the dish, and there’s a balance between the two. I was really looking forward to the Sea course, as Chef Manuel excels with seafood (see the ceviche above). I wasn’t disappointed. And, in fact, after discussing it, Amy and I were hard-pressed to choose a favorite between the two seafood dishes. The Spanish influence on Mexican cuisine is evident in Chef Manuel’s Pescado a la Veracruzana, an elegant plate of halibut, saffron rice, olives, and tomatoes. While it might seem like a simple plate, each element was flavorful and well-suited to pairing with the others. The sweetness of the tomatoes balanced the saltiness of the olives, and the delicate saffron rice with the perfectly cooked, firm fish. Camarones a la Talla was another standout in a meal of well-executed dishes. This… this is the kind of dish that makes me want to lick the plate (And that folks, is why we skip the wine pairing. No plate-licking in public.). Yes, if you look closely you’ll notice that it’s a deconstructed take on a shrimp taco, but with Chef Manuel’s unique approach. First of all, the grilled, head-on prawns were as tender and sweet as you could hope for. The black bean purée is a flavor-bomb, where again Chef has worked his magic with both flavor and texture. There was so much goodness going on here that the tortilla got a bit lost among the other components on the plate, and the dish would have worked just as well without it. When the Land course arrived, I had to rely on Amy’s palate for tasting notes. Not being much of a meat eater, I’ll say honestly that I was less engaged in the Land courses, although the plates looked beautiful. (I can be persuaded to try a bit of pork or poultry here and there, but generally, I stick to fish and plants.) More representative of the cuisine of central Mexico, both dishes struck me as upscale comfort food. 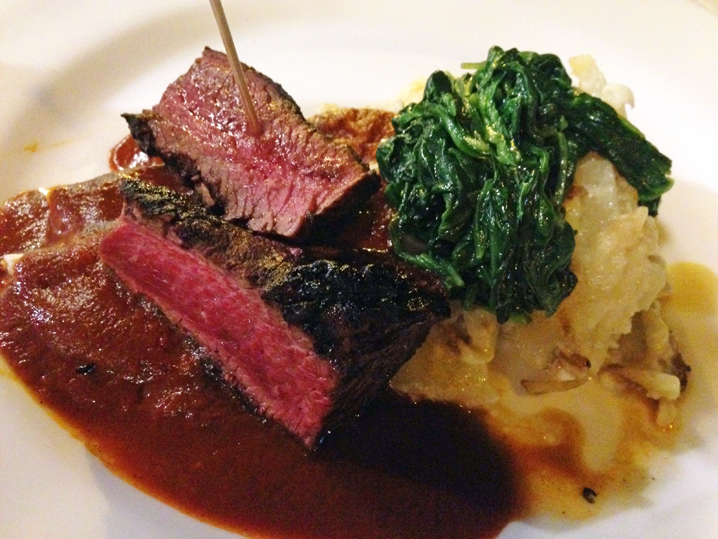 The Carne a la Tampiqueña was a hearty dish of rare hanger steak with red sauce, a small cheese enchilada, confit potatoes, and garlic spinach. I loved the sauce and the sides. Amy said the beef was tasty and well-cooked, and the potatoes were rich and delicious. The Codorniz Con Mole exhibited the same elegance as the Pescado al a Veracruzana: simple ingredients cooked perfectly and paired well. 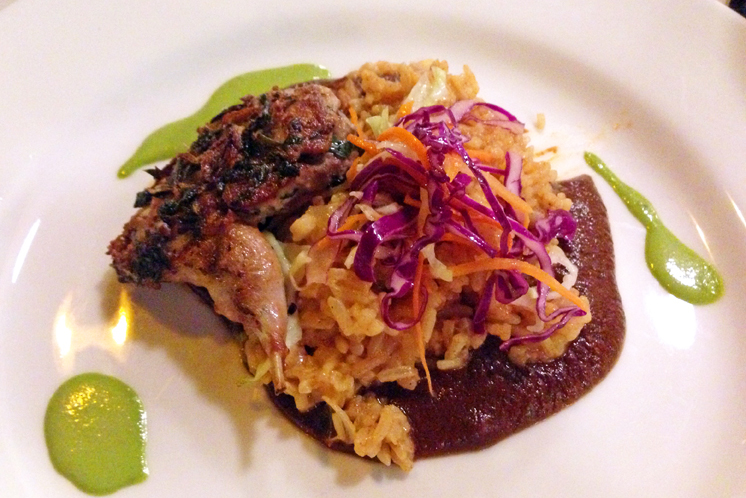 Sweet pairs with tart; simple (rice) pairs with rich (mole and quail). It’s a small plate, but there’s a lot going on flavor-wise. I made an attempt to try the quail, but, damn, those things are tiny, and I couldn’t figure out where the meat was hiding. Amy took the lead on that one. The mole sauce and rice, though? I’ll eat that all day. As the evening was winding down, and we were approaching the final course, many of the tables had emptied. We’d enjoyed a nice, long, leisurely dinner, and were expecting our final two plates when our server brought some bad news: the kitchen had run out of one of the desserts — the classic tres leches cake. A little disappointed, at least we’d still be able to taste the much-talked-about “pumpkin cake.” Listed on the menu only as Pastel de Calabaza with Pumpkin Seed Brittle, I wasn’t sure what to expect, but it had been the buzz of the restaurant all night. My training in pastry and experience working in the industry has taught me that dessert has to be at least as good as the courses that have come before it. 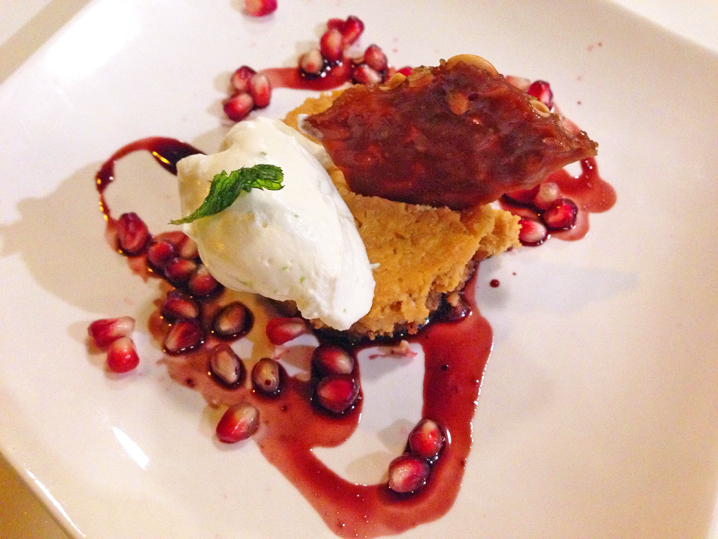 A thoughtful chef won’t treat dessert as an afterthought or throwaway course. As the final course, dessert is your last chance to wow the customers, to put an ending on the evening’s experience, to send them home talking about what they ate. Oof, no pressure little Pastel de Calabaza. 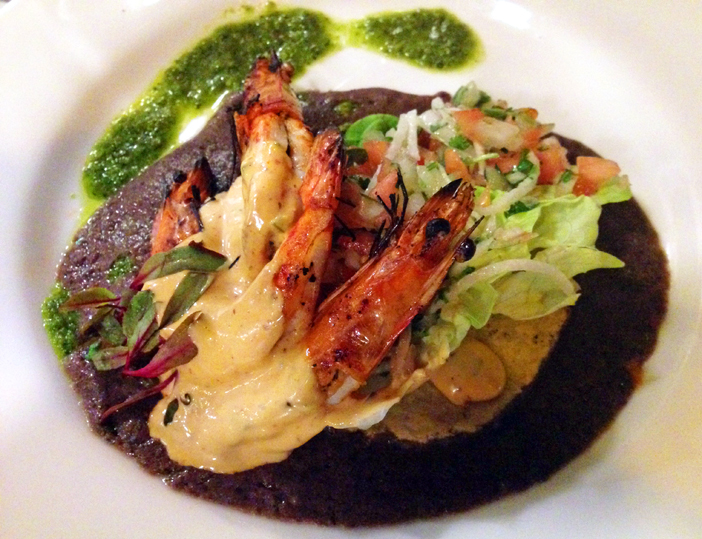 All in all, a delicious tour of Mexico and a lovely evening — without leaving the 650! The evening’s standouts for me were the Sopa Azteca, the seafood dishes, and the Pastel de Calabaza. I’m hoping to see some of these dishes on the regular menu in the future — or at least that Pastel de Calabaza. The next Viajando by LV Mar, Destination: Caribbean is coming up this week on Wednesday, October 1. Are you on the list? *Full disclosure: My friend and I were guests of the restaurant for the evening of Viajando by LV Mar, Destination: Mexico. My opinions are my own and not provided in exchange for participation in the event, nor at the request of the restaurant or its employees. You are currently browsing entries tagged with Pastel de Calabaza at 650Food.